Having hard floors is not only pretty, and creating a classy and sophisticated atmosphere for your home. They are easy to clean and maintain but what happens when they worn off in time and you start thinking about re-flooring your home. Well, our company is a cleaning services provider, operating here in Highbury, N5 and we are offering you a much easier and cheaper alternative – professional hard floor cleaning and polishing. We have created this service with the simple goal of helping people maintain their floors in their best possible state, and to save them money. What we are offering your is a one-of-a-kind cleaning service. Hurry up and give us a call to hire us right away. Enjoy our convenient service and amazing prices. What our cleaners will do is vacuum your floor first. Then they will prepare the appropriate cleaning machine, the will use the best cleaning products for your type of floor, and will clean it thoroughly. They will even clean the hard to reach places. We can help you with your hard floors cleaning whether they are limestone, marble, tiles and grout, terracotta, stone, etc. What we will give you is going to be a very deep and thorough cleaning that will help bring back the previous glory of your hard floors. Plus, once our cleaners have finished cleaning, they will polish your floors. 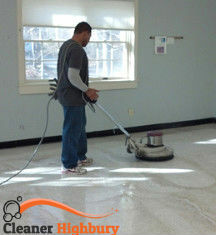 For the purpose, we have equipped them with state-of-the-art buffing machine that can polish any type of hard floor. They use several different abrasives, depending on your floors, so that you are sure our cleaning service will not damage your floors. They will lave your floors looking fantastic, we guarantee it. 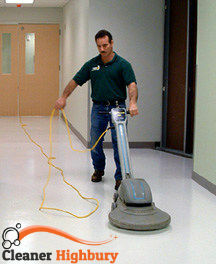 Get the best hard floor cleaning and polishing service in N5 now. We are expecting your call.